After having spent four of the previous five nights standing outside in seriously cold temperatures until well past midnight, it wouldn’t have been surprising if I couldn’t muster up much excitement about yet another cold night. That couldn’t have been further from the truth. Yes, I was tired, but the adrenalin had kept me going and I was buzzing with it again as I boarded the bus to the Arctic Snow Hotel. Tripod in hand, I was ready for the northern lights — even if they weren’t forecast to be quite as good as the solar storm of the night before. 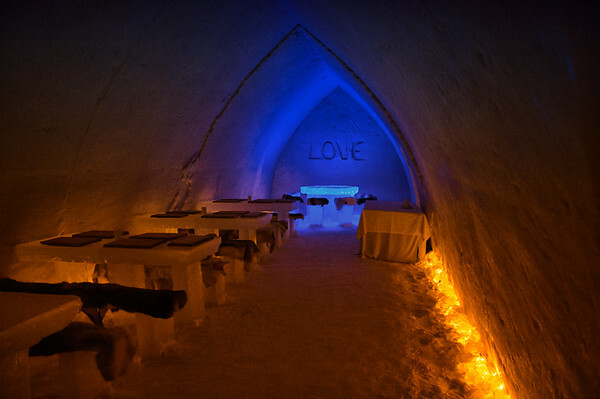 The dining room in the Arctic Snow Hotel. Better wear your woolies for this one! When we arrived at the Arctic Snow Hotel’s icy gates, we were divided into two groups and headed into the hotel to look around. Since it was already about 10pm — the tour starts one hour later in March due to the rapidly extending days — we couldn’t go into the hotel’s rooms. We wouldn’t want to disturb any of the guests that were already burrowed into sleeping bags there! Many of the other rooms were open though. 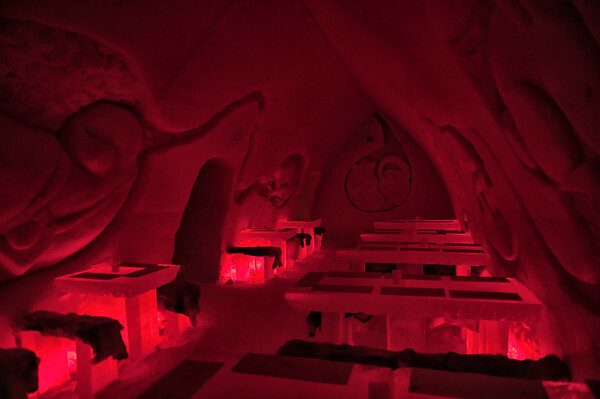 All of them were meticulously carved out of snow in November and December to be enjoyed for only four months before the hotel closed to slowly melt away with the rest of the winter’s snow. I especially liked the walls of the dining room, which were finely carved with various creatures, from rabbits to Tyrannosauruses. It seemed to be a celebration of life both great and small…and everything that comes along with it (which is why “LOVE” was scrawled across one wall). All you need is love…and a meal. The chapel was a small room that would have been very claustrophobic were it not for the gorgeously lit altar. It was simple but very well-done…but I’m still not sure if I would want to get married there! At least it would make for a very quick ceremony. 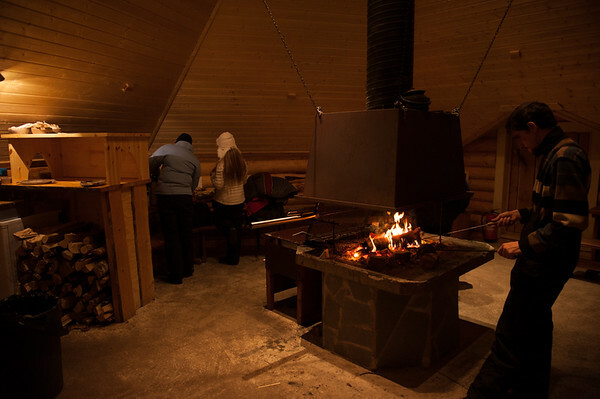 I was fascinated by one thing the guide told us — the fact that the hotel had a sauna made completely out of snow. How this is possible I’m not sure, but as a guest you’re welcome to go sit on the benches that sit on pure snow and steam all of your aches and pains away. At the end of our short tour, we were shown to the lavvu that would be our home base for the next two hours. It was warm and inviting; the orange glow of the windows and the chimney belching smoke called to us and offered moments of comfort in between checks for the aurora. Along with warming our cold fingers next to the roaring fire, we could serve ourselves hot tea and even cook up a sausage or two. The ideal aurora watching spot was only a few steps from the hut. As I went downhill towards the frozen lake, the few lights of the isolated hotel began to disappear and the sky opened up above me. The further I moved out onto the half-meter-thick ice of the lake, the better my view of the sky was. Unfortunately, the waxing crescent moon kept complete darkness from descending, but on the plus side it illuminated the tree-lined landscape and the sometimes-not-very-even ice. I have to admit that I was very jealous of the Arctic suits that many of the others had rented for their whole stay in Rovaniemi, since it felt all the more cold with the chill radiating up from the ice as well. I was very glad I’d thought to bring my second jacket — one purchased just before arriving in Finland in anticipation of the sub-negative-thirty temperatures. It took us all varying amounts of time to give in; I stayed out for about ten minutes before I decided to head back to the lavvu. I needed to get my tripod ready anyway. What I didn’t know was that I was in for a horrible surprise — and one I feared would not only stymie my photographic intentions for this night, but for the rest of my trip as well. My tripod head was jammed…and not, conveniently in a position that would be useful. Instead, the tripod mount flopped uselessly around even though the knob that locks it in place was locked itself. Despite the fact that we had no common language, a few Dutch men saw me struggling and offered to help; sadly, their efforts were as futile as mine. It’s hard to describe the sheer frustration I felt at the moment the Dutch guys held the tripod head out to me as they shook their heads. I was loath to put the tripod away because it would be admitting defeat, but at the same time, it was a bit freeing. I knew there wouldn’t be any use taking more than a photo since they’d all be blurry anyway — so why not just sit back and enjoy the moment? The lavvu is pretty welcoming on the outside too. That decision was helped by the fact that, the night before, I had put down my camera and just watched in awe as the best part of the solar storm flared right above our heads. It was absolutely the right decision — rather than concentrating on my tripod and framing, I was fully in the moment and it’s now one of my strongest memories from Lapland. It took three or four short walks to the lake before the familiar cloud-like formations stated to float upwards across the northern sky. It seemed to be the first glimpse of the northern lights that many in our group had had — especially the large group of Japanese people that had traveled across the world solely to see the Arctic phenomenon. At first they took no notice of the slowly-forming aurora, but then a cry went up. Soon, they were all yelling in wonder and pointing excitedly upwards. It was impossible not to be excited with them. There were hugs all around. People were literally jumping for joy as the whitish lights started to shimmer with green, while others frantically yelled “no flash” at the many people that were trying to capture the moment. The only photo I managed to capture — what it didn’t capture was all the screams as the lights danced across the sky. The thrill of being part of a group whose bucket lists just had one more tick added to them made the evening worth it on its own. By no means had seeing the aurora become old hat to me — it’s surprising that my face hadn’t permanently frozen into a smile by that point — but it’s hard to replicate the shared joy of a group on your own. It’s like the difference between seeing a funny movie with other people versus on your own. That was especially true when the group is screaming and stampeding back from the bus because their guide has just told them that she’s delayed our return because the lights are out stronger than ever. Even though I don’t have spectacular northern lights photos from the Arctic Snow Hotel, I still considered it to be a very successful trip. I would say that about any night that featured the northern lights, especially when it was the fifth out of six nights in Finland. Plus, it showed me that sometimes I do need to step away from the camera and appreciate the moment — even if that moment is watching everyone else snap photos as their dreams come true. 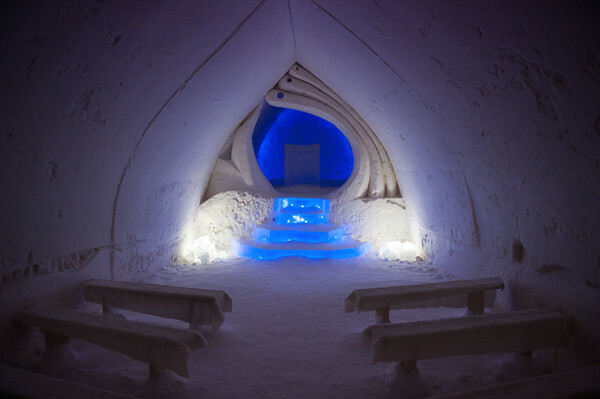 I visited the Arctic Snow Hotel as a guest of Visit Finland and Visit Rovaniemi. 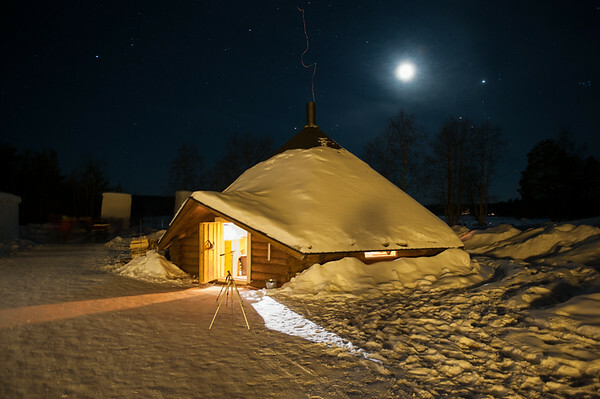 The Arctic Snow Hotel is located 20km to the north of Rovaniemi off of E79. It is open from Boxing Day until the end of March each year. 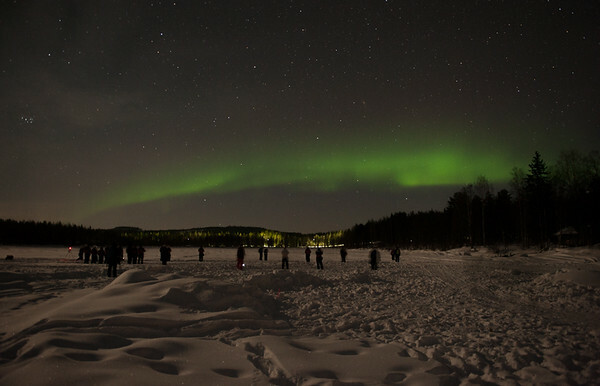 They run daily northern lights watching tours from Rovaniemi for €59. the whole experience was great, as an architect it was interesting to see a hotel made of snow, the designs were fun, the snow sauna and snow bathing were a first time experience. the staff was just amazingly friendly and helpful…. the sleep in the thermal sleeping bag was unexpectingly warm, a bit tight given i am a big and tall man. but slept like a baby nonetheless.